When it comes to shower storage ideas, it’s impossible to overlook the humble shower caddy. Shower caddies help to ensure that you have quick and easy access to the products you need without having to search through cupboards – potentially with wet hands – or risk knocking items off a shelf, helping to ease the whole process of showering. As well as their sheer convenience and usability, shower caddies are also crucial to managing the overall look of your bathroom. If products can only be stored on shelves, the side of a bath, or on the sink, then the room will always look somewhat cluttered, even if it is otherwise well-organized. Given the numerous benefits of shower caddies, it’s no surprise that millions of people rely on these handy products for everyday use. However, not all shower caddies are equal, with many products failing to perform the crucial task of offering effective, reliable shower storage – so how can you be sure you’re purchasing the right shower caddy for your needs? Simple: you can read our reviews of the most popular items on the market, and decide which might be best for you. If you’re looking for a robust yet elegant shower caddy that looks the part and performs its core function well, then look no further than the simplehuman Tension Shower Caddy. As one would expect given the name, this is a tension shower caddy, which means there’s no need to worry about drilling holes or using tools in order to install it. Thanks to its reinforced aluminium pole, clever high-compression springs, and reliable rubber feet, the height can be adjusted between six and nine feet while remaining secure and stable at all times. In terms of design, there’s plenty to like about this caddy. The overall look is pleasantly modern, with silver finishes on both the pole and the shelves, which are rather futuristic in design while still maximizing usability. Usability, of course, is the ultimate test of any caddy; many caddies look great, but when put to use, they struggle. Thankfully, the simplehuman tension shower caddy has clearly been designed with the end user in mind. The shelves can be vertically adjusted to make room for taller products and, when you’ve found a shelf arrangement that suits you, the shelves stay firmly in place. Furthermore, the majority of products can be stored on the shelves themselves, there are also a number of hooks and hangers you can use for wash cloths or scrubbing brushes. In terms of longevity, this caddy has clearly been built to last. The pole and shelves are corrosion resistant, so there’s no risk of rust or unsightly discoloration. The pole has no flex to it whatsoever, so it should stand straight and true for many years to come. Overall, this is a great caddy for all purposes, with a few design features that help to make it particularly suitable for those living in properties with high ceilings. The “no tools” installation is definitely appreciated and works exactly as one would expect, the design is fuss-free yet attractive, and it’s pleasantly easy to clean. While the price is a little higher than some of its competitors, we believe this is justified by an exemplary performance that should allow this caddy to stay firmly fixed in place, looking its best, for many years to come. Upon learning that the simplehuman Shower Caddy Plus relies partly on suction cups for its stability, you may be dubious as to just how secure the unit can ever be. Anyone who has ever used suction cups will know that good adherence to the wall is far from guaranteed, which can be especially hazardous in a shower situation. However, there’s no need for concern; while this unit does indeed use suction cups, they are more supplementary than essential. The shelves, and their contents, are held in place by a well-designed rubberized shower head clamp, the suction cups simply providing additional sidewards stability rather than being expected to take the full load themselves. The finished result is undeniably impressive; the caddy remains firmly in place while items are removed and replaced, so there’s no risk of the unit coming loose mid-shower. As we saw with the first simplehuman caddy featured above, the materials chosen are designed to last, with stainless steel construction helping to ensure the unit stays rust-free for the duration of its use. The shelves are capable of supporting heavy products, are easy to clean, and also allow bottles to be stored upside down in order to allow every drop of product to be used. Furthermore, the shelves can be adjusted both horizontally and vertically by turning a dial at the base of the unit; while the ability to adjust shelves vertically is fairly standard, the horizontal adjustment is unique, and works flawlessly every time. We were also impressed by the bottom shelf of this caddy, which features a washcloth holder and a quick-dry soap dish. These are small touches, admittedly, but they all prioritize the user experience, and ensure that the Shower Caddy Plus is genuinely a pleasure to use. There’s really nothing to dislike about this shower caddy. It may initially appear too small for some purposes, but the ability to vertically and horizontally adjust the positioning of the shelves soon proves otherwise. The shower head clamp and suction cups work in perfect harmony with one another, and the price – given the level of innovation on offer – is more than reasonable. If you’re looking for a customizable shower caddy that you can install without the need for tools, but which you can trust to always stay in place, you won’t go far wrong with the Shower Caddy Plus. ORGANIZE YOUR SHOWER SPACE - Large capacity to organize your shower essentials and keep them all within easy reach. MAKES ROOM FOR TALLER BOTTLES - The neck extends to make room for taller bottles on top shelf, and lowers the caddy for easy reach - very kid-friendly. EXTRA CAPACITY - Includes a full bottom shelf, washcloth hanger, small-item holder and two dividers. ADJUSTABLE WIRE SHELVES - Easily slide up and down to make room for tall soap or shampoo bottles with a simple turn of the quick-adjust dial. 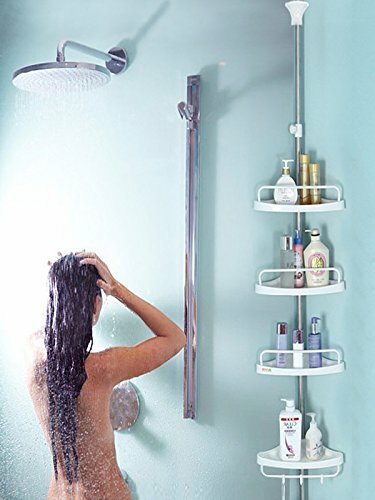 FITS MODERN BULKY SHOWER TOOLS - Designed to store large items such as facial cleansing brushes, razors and electric toothbrushes. Corner shower caddies are perhaps the ultimate in space-saving shower storage solutions, and the ALLZONE Constant Tension Corner Shower Caddy meets the needs of the user with ease. Operating on a tension system that utilizes a high compression spring, the caddy is secure and durable and should withstand daily usage with ease. Unlike the options we’ve discussed thus far, this ALLZONE option uses white rather than stainless steel shelves to hold its products. While acknowledging such a topic is always somewhat subjective, we liked the resulting aesthetic; the white is crisp, clean, and helps to ensure each shelf looks well-organized. The shelves also offer great functionality, with side protective barriers helping to prevent items from falling to the floor. 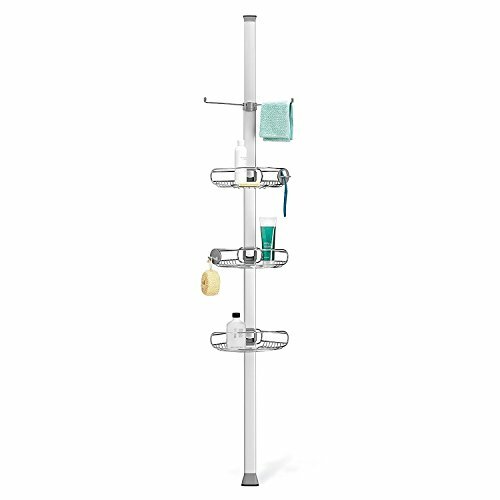 As this is a tension shower caddy, the overall length is important; lengths between 4” and 9” can be achieved, making this unit a suitable choice for most bathrooms. The shelves attach to the pole by rubber rings, which can slide up and down the pole in order to create extra head height for larger products; a system that works incredibly well, while still ensuring the shelves are sturdy when in place. 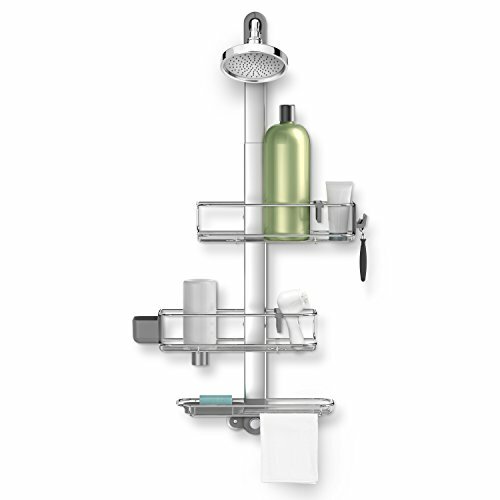 Furthermore, you should have no issues maintaining the ALLZONE tension shower caddy, as it features automatic draining and easy-clean shelf surfaces. There’s also no need to worry about rust; ALLZONE say that the shelves will never rust, so the unit should stand the test of time. To conclude, there’s plenty going for this intelligently-designed caddy. 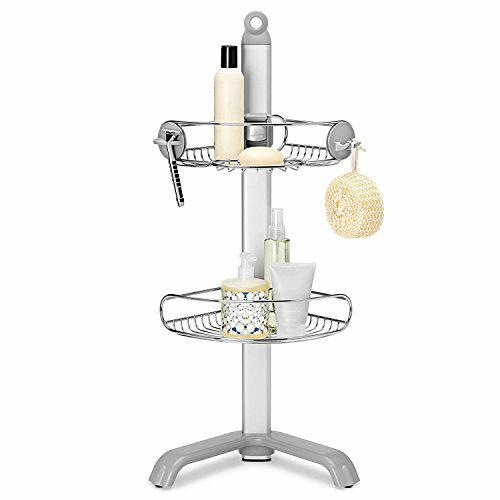 The white shelves of this shower caddy allow it to stand out from the more common metal-only options, it offers great customization options, and the corner design is a perfect choice if you’re looking to preserve space; a great choice for those looking for an inexpensive shower caddy that offers something a little different in terms of aesthetics. STRONG RUST RESISTANT POLE: Poles made with galvanized pole and brushed stainless steel, much better than the one used steel pipe with chromed or brushed. FAST & EASY INSTALLATION: Installed within minutes, no wrench and no tool needed.No any damage with ABS end cap. HEAVY DUTY SHELVES: Durable rubber rings hold each shelf very sturdy and can slide up and down to make room for tall bottles. NEVER RUST and super easy to clean. 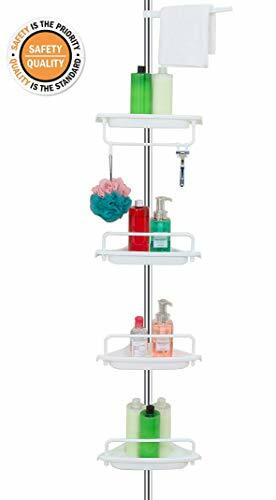 The H&A Strong Shower Storage Caddy is a product that combines many of the benefits of the items we have discussed thus far. First and foremost, this is a tension caddy, with the pole length varying between 3.5 feet and 10.2 feet. This huge variation in lengths allows for experimentation with how you wish to position the caddy; you can opt for floor-to-ceiling installation or, if your shower is located in your bathtub, from the top of the bath to the ceiling. It occurred to us that such variation and ease of installation might make this caddy a particularly good choice for renters or those who move home frequently; it assembles and disassembles easily, and the length options ensure it can be customized for most properties. As one would expect, the pole is strong and holds firmly in place thanks to non-skid feet and consistent, reliable tension. The shelves are also more than fit for purpose, and you should have no problems storing heavy items or using pump dispensers placed on the shelves. In terms of aesthetics, the H&A strong shower caddy is another unit that has chosen to move away from the metal designs and opt instead for durable plastic. The shelves are white, which should complement any decor, and are easy to clean by wiping a wet cloth over the surface. The shelves are also triangular in order to allow the caddy to sit neatly in a corner, which – as we’ve mentioned – is a great choice if space is somewhat lacking. In truth, it’s tough to find to find fault with this tension caddy. It utilizes good materials and clever design in order to provide ample shower storage, while remaining relatively inexpensive and enjoying a familiar, classic look thanks to those attractive white shelves. Imported.Heavy Duty,Easy Installation,no drilling,no cutting required. Last but not least is the simplehuman Corner Shower Caddy, which is perhaps the most straightforward caddy we have featured in these reviews. However, that’s not to suggest this item is basic: in fact, when you come to use the item, you’ll realize that a huge amount of thought has gone into ensuring this caddy performs perfectly. Unlike the options discussed in our earlier reviews, this caddy does not attach to the shower wall or to use a tension mechanism to secure to the floor and ceiling. Instead, it is a freestanding corner caddy that can be positioned either directly on the floor or the edge of a bath. For this purpose, it works well, due in no small part to adjustable feet that help to ensure it is able to stand securely even on uneven surfaces. The all-metal design is attractively modern, while remaining neutral enough to work with any bathroom color scheme. Given that the item is all-metal, rust is always a concern, but simplehuman have sought to address this by using stainless steel construction to guarantee a corrosion-free experience for the life of the product. The product also functions well, with two adjustable shelves that move seamlessly up and down the aluminium pole to accommodate different sizes of products. As well as the shelves, a number of hooks provide the opportunity to store items such as razors, toothbrushes, and accessories as needed, so while this caddy may be a little smaller than other options, it is nevertheless capable of holding all essentials in place. While not the most conventional shower caddy in terms of design, this unit from simplehuman is capable of performing its core task well. We also admire the beauty of its simplicity; you set it in place, adjust the feet if needs be, and then it’s ready to use. If you’re looking for a straightforward item that works well and is available at an accessible price point, you’ll be delighted with the simplehuman corner shower caddy. ORGANIZE YOUR SHOWER SPACE - Maximizes shower essentials storage in corners. STURDY ALUMINUM SPINE - Reinforced aluminum pole supports the caddy and helps keep it steady. MAKE ROOM FOR TALLER BOTTLES - Adjustable shelves slide up and down to make room for tall soap or shampoo bottles. STABLE EVEN ON UNEVEN FLOORS - Adjustable feet help keep the caddy upright. CONVENIENT STORAGE HOOKS - Hold a razor, loofah, toothbrush or other accessories. If you have been searching for shower storage that is capable of simplifying your life, and helping to declutter your bathroom, then you can’t go wrong with a shower caddy. Now you’ve read the reviews, you can select the shower caddy that suits your specific preferences and look forward to an effortless showering experience in future.